Lucky Club Casino :: Big Rig slot - US Players Welcome! Get ready to hit the road and enjoy your ride with Big Rig, the shiny new 25 line slot from Nuworks. BIG and RIG are grouped wilds, and when both of them appear the feature is triggered! You get to choose between 12 free games and 7 re-spins, and whenever BIG or RIG appear in the free games each will award an added bonus of up to 10 times your bet. 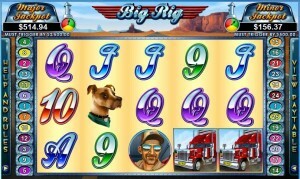 Big Rig :: You can try this NEW Slot game right now at the following casinos: Buzzluck Casino and Lucky Club Casino.